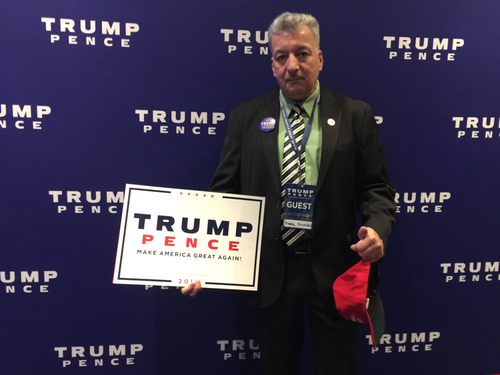 Frank Finocchio has been volunteering for Donald Trump since he launched his campaign. He says Trump reminds him of former New York Mayor Michael Bloomberg. "He was a businessman, he wasn't a politician. And what happened with him, he ended up being elected three times as Mayor of New York." Bloomberg, however, is no fan of Trump and once said of him, "I'm a New Yorker and I know a con when I see one." Melissa Alt, a New Jersey baker who made this cake and brought it to Trump headquarters tonight, told this to CBC News. "Hillary was harder to sculpt. Trump was easier because he has more distinct features but he was harder to paint because of his skin tone. Every photo looks different. It was hard for me to figure that out but I think I got it in the end okay. I didn't want to make him to orange. So that was the most challenging part." 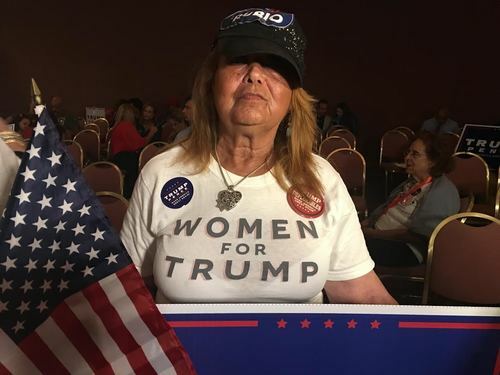 And yes, she'd like Trump to have a slice, once he gets here. 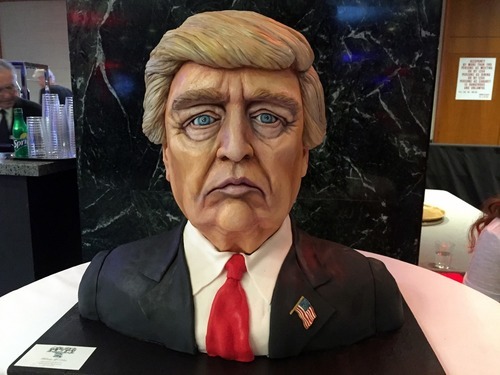 The cake has been trending online, as we pointed out in the blog earlier, with people Photoshopping Trump's cake face onto other iconic photos and into wacky situations. This post has been corrected to reflect the baker is actually from New Jersey and not New York as initially reported. Just checked on an election-night party attended by mostly Democrats. Some ashen faces there, but others are saying this is still early and that Clinton tends to command more support in urban precincts, which tend to report later than more conservative, rural areas. There has been a little bit of drama at the U.S. Ambassador's party tonight in Ottawa involving Finance Minister Bill Morneau. We will have video from the event shortly and will share it here. CBC News is projecting that Trump will take Ohio. Here is the breakdown. Obama won the state in 2008 and 2012. The win bodes well for Trump. No Republican has won the presidency without Ohio since Abraham Lincoln was elected back in 1860. Only two Democrats in the last century - Roosevelt in 1944 and Kennedy in 1960 - have won the presidency while losing Ohio. 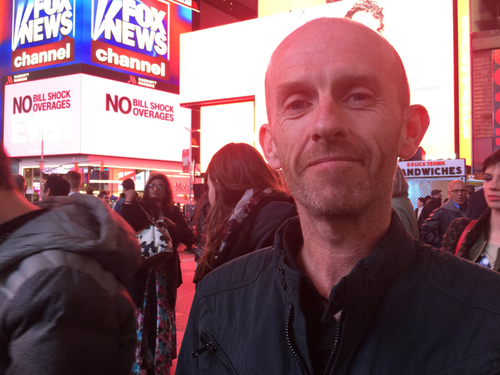 From CBC’s Lyndsay Duncombe in New York City. Katy Perry just took the stage outside Clinton headquarters – even she looks anxious. The pop star confesses that her parents voted for Trump. I walked into the crowd of supporters and spoke to two volunteers from New Hampshire. They told me they are nervous about how the night is playing out. One woman said she got the sense Trump supporters were too embarrassed to tell pollsters they were supporting the Republican candidate. Another woman looked shocked. She said this is especially tough for New Yorkers to understand, given how diverse this city is. This country is divided, she said. They're going like hot cakes. 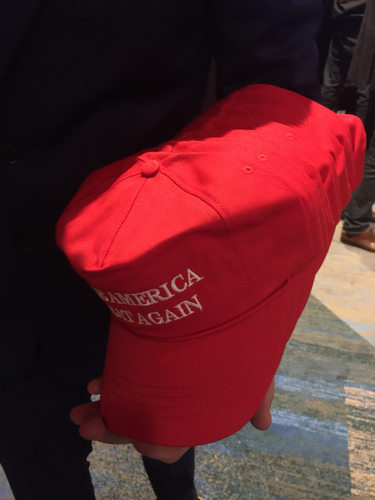 Trump campaign workers are handing out a lot of these at campaign HQ. If not Virginia, how about Michigan? The inclusion of Virginia in Donald Trump's column had big implications — it gave him some options. The key for Donald Trump is to win Florida, North Carolina and Ohio, where he currently leads, and then add another big Democratic state. The polls suggested he had few options. Maybe Michigan, Pennsylvania or some combination that included Wisconsin, Colorado, Nevada or New Hampshire. Having Virginia opened up some unexpected options for him. Without Virginia, we're back to the kind of path that had been mapped out as possible for Trump. If you listen to U.S. outlets that have already called Virginia for Clinton, it's back to the narrower path for Trump. Pennsylvania and Colorado don't look particularly promising for Trump, while early voting was rough for him in Nevada. So, that means it is down to Wisconsin and New Hampshire or Michigan. Can Hillary Clinton hold Trump off — or maybe knock a state like Arizona out of the Republicans' grasp? 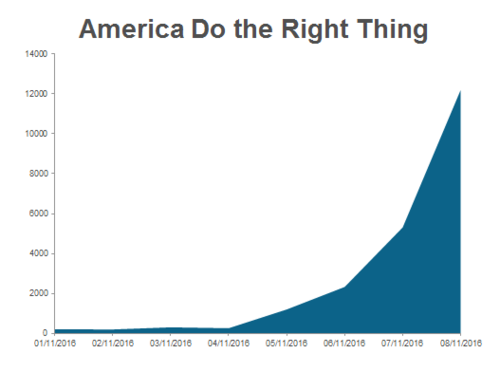 Over the past seven days, a global audience watching the U.S. Election have tweeted “America do the right thing” more than 18,000 times. 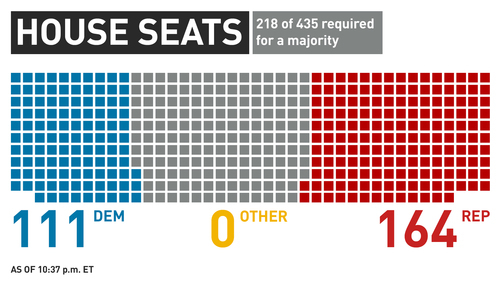 On Election Day so far, it has been said more than 12,000 times. Maricopa County Sherriff Joe Arpaio, a staunch supporter of Donald Trump, is accused by the city’s Latino community of racial profiling for his repeated immigration sweeps through Latino neighbourhoods, and faces criminal contempt charges for failing to stop them. 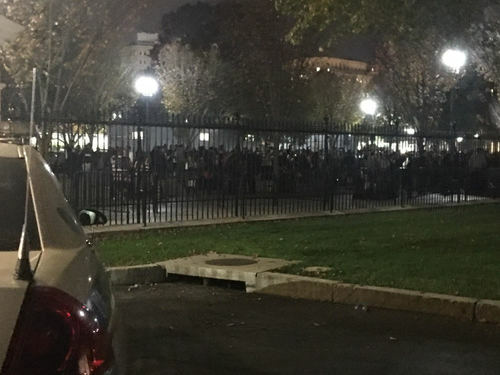 Tonight, more than a hundred people have gathered in Phoenix's Grant Park near a big-screen showing election results, hoping to see him fall. 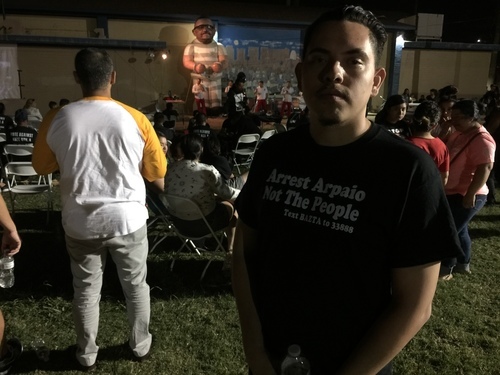 “I’m here to celebrate Arpaio’s defeat,” says 24-year-old Eduardo Pym. Pym was born in Mexico but has lived in Phoenix since he was about a year old. To him, Arpaio represents the worst of xenophobic America. 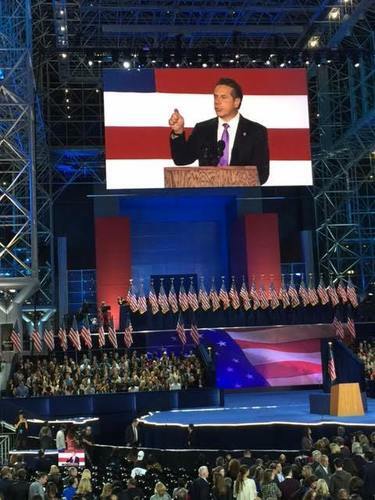 New York Governor Andrew Cuomo tells crowd at Clinton headquarters: "This has been some election, and this is some night." He tells the crowd he still believes it will still be a good night for Hillary Clinton. Ohio has been called for Trump and that's disappointing news for the Democrats here tonight, including Hamilton County party chair Tim Burke. He said they lost because the blue collar union workers who normally cast a ballot for the Democrats decided Trump had more to offer for them. This is particularly noticeable in the northeast where union members usually vote for the Democrats. In Trumbull County, Obama won by more than 40 points in 2012. Trump is in the lead there right now. 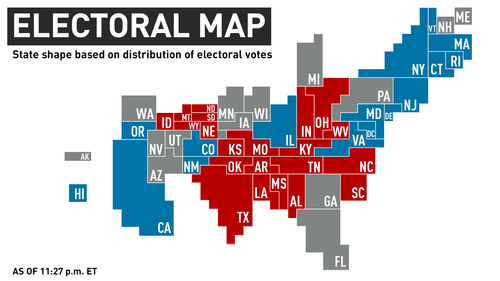 The latest breakdown, numbers wise and state-by-state. 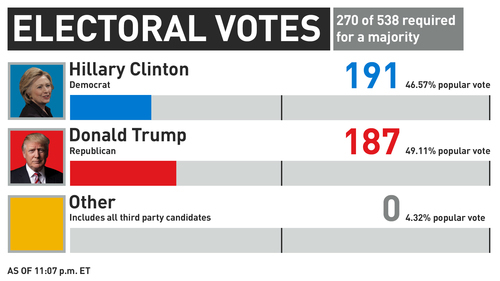 Trump continues to lead, 168 votes to Clinton's 132 votes. It's 11 p.m. That means polls have closed in California, Oregon and Washington. California has 55 electoral votes to offer. The latest results, with CBC News projecting a Clinton win in California. 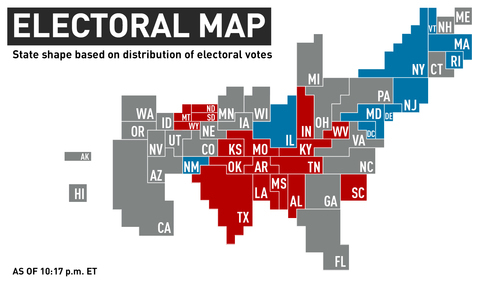 All eyes are on Michigan now, home to 16 electoral votes. Trump is leading there at the moment with 48.52 per cent of the popular vote, to Clinton's 46.41 per cent. Others have 5.07 per cent, with at least 57 per cent of precincts reporting. The state voted for Obama in 2008 and 2012. Clinton needs to see a win there. It's been a solidly Democratic state in the past, but Trump has been campaigning in it a lot as of late. Nearly half of the voting-age population in Michigan is white without a college degree, who are more likely to vote for Trump. 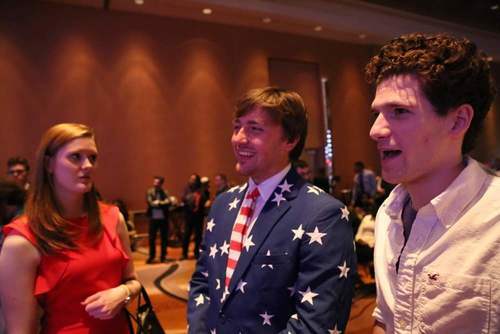 A look at an election party tonight in Detroit as results come in, via the CBC's Alex Brockman. James Rubec is with Cision and is tracking trends and insights online tonight. 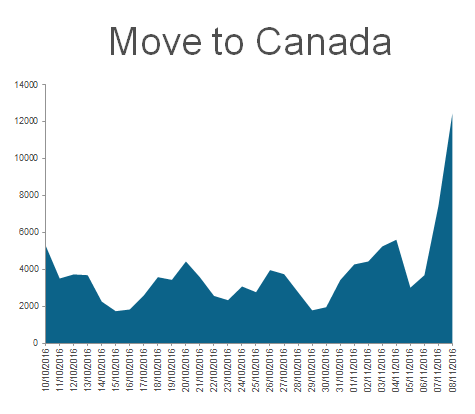 Comments about Trump's potential win and Americans planning a move to Canada are growing. In the last 30-Days we've found more than 100,000 mentions and tonight it has grown substantially. Note the spike at the end of the graph. There are some reports on social media that the Immigration Canada website is down. The website is indeed slow, and sometimes shows an error message. But the page does load properly after a minute or so, or after hitting the "refresh" button a couple of times. CBC News has reached out to Immigration Canada for comment but has not yet heard back. This screen went away after a few refreshes. Finance Minister Bill Morneau declined to comment about falling Dow futures during election night party put on by the U.S. ambassador. Already Clinton supporters here at the Hamilton Board of Elections are talking/joking about moving to Canada. Want to know if we have any tips for them. Apparently they aren't the only ones, with the news about the Canada Citizenship and Immigration page. CBC News is now predicting Trump will win Florida. Since 1936, Florida's vote for president has lined up with the overall winner in 18 of 20 elections. Colours (a.k.a results) basically everywhere on the map now. Alaska is the notable exception. Results start coming in from there around 12 midnight ET, in about 15 minutes. If you can write in a whisper, that's what I am doing now from the White House. For the last hour or so it has been a very quiet place. We can see the silhouetted images of people at the fence staring at the house, but, they have been quiet as mice. Until about 38 seconds ago. Now that clutch of people are shouting BLACK LIVES MATTER. 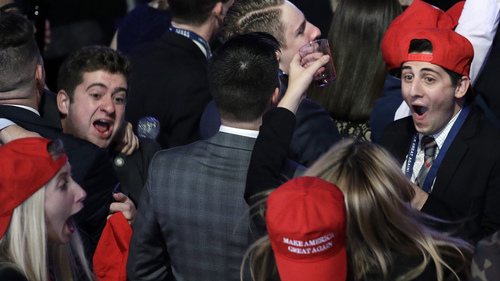 Somewhere, blocks behind us there has to be a Trump party of sorts because there are occasional roars of cheering that coincide with each new state announced for Donald Trump. 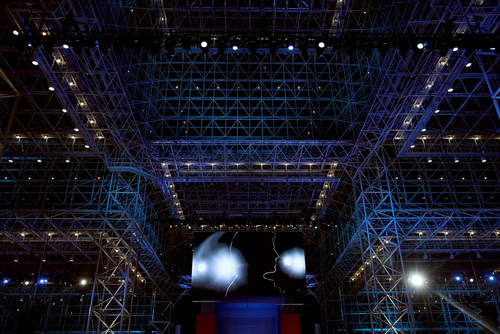 Seeing a few lights go off in the East Wing, where the residence is, but cannot actually imagine the Obamas are sleeping. A cheer went up through Times Square as California was called for Clinton but there was silence when Trump took the key state of Florida. No surprise with California but the pro-Clinton crowd seemed eager for a win. Paul Heseltine is visiting from Great Britain and says this is Brexit all over again "It's like a Brexit on steroids. The way people vote at the last minute, it's like an impulse vote. It's like a vote against the system. The people want to vote for something different, they just don't know what they want, but they know they want something different. They don't know what they want but they don't like what they have at the moment. It's a vote against the establishment"
Some more info on how spotty the Canadian Citizenship and Immigration website has been tonight. 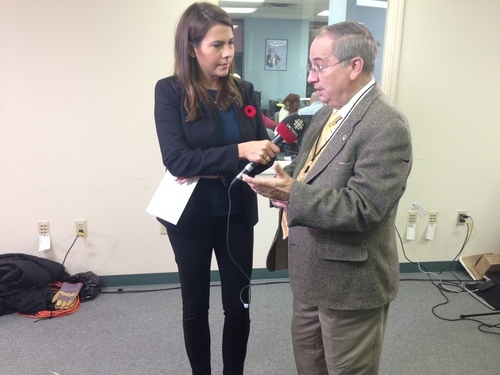 The CBC's Melissa Kent is at Clinton HQ in NYC. 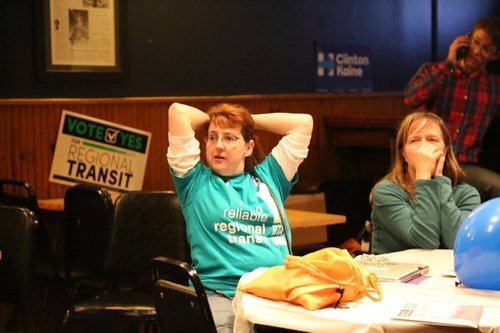 Hillary Clinton supporters in Michigan are anxiously watching the polls showing the election could hinge on their state. All eyes in the room are on two projectors showing live results, people are sitting on the floor and many have drinks in their hands. Democrats have held Michigan since 1988, but with a stronger-than-expected turnout in the rural counties surrounding Detroit, republican Donald Trump held a lead late Tuesday night. "Mind-blown," says Erin Grabski. 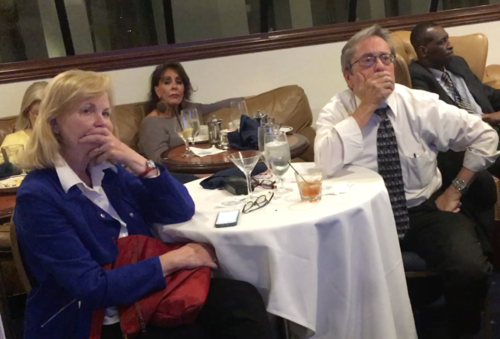 She's one of hundreds of Democratic supporters in downtown Phoenix watching in horror as the country inches closer to a Trump presidency, regardless of how their state of Arizona votes. "Maybe we should ask Trump what rigging really is because that's what it feels like," Bernard says. 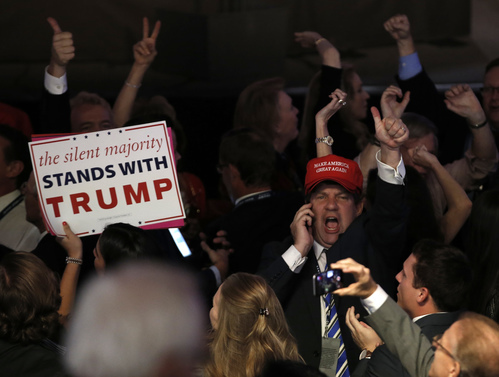 He lives in Mesa, Ariz., "voted the most conservative city in America." He feels it's all but over. Arizona, he says, won't save Clinton. "He won Florida, Ohio... he won the states he needed to," Bernard says. 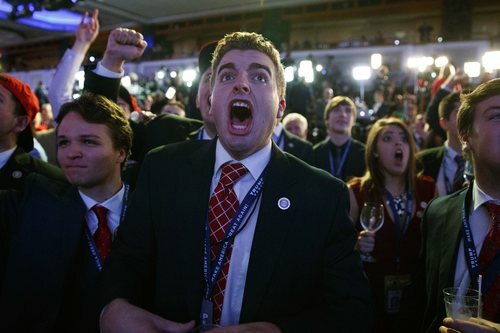 "It's a red win, thus a red wedding for America." In the 2000 election, George W. Bush won the presidency by winning Florida by a very narrow margin over Al Gore. The margin was narrow enough that only a fraction of the votes for Ralph Nader, whose supporters were more left-leaning, would have decided the election in favour of Gore, the Democratic candidate, had they gone in his direction instead. At the moment, Gary Johnson, the Libertarian, has 3.6 per cent support in Michigan and Jill Stein, the Green candidate, has 1.1 per cent. The margin between Donald Trump and Hillary Clinton? About one point. Hillary Clinton's is trailing Donald Trump by less than the combined share of the vote for the third party candidates in Wisconsin, New Hampshire and Florida as well.